Hi everyone and happy 2015 – hope things are going well for you in your life and businesses so far this year. Version 2.8 of SBPM has been launched and you should have received a copy via email in the last 24 hours. You can replace the existing sbpm.php file in your sbpm plugin folder or delete and reinstall this new version. I will be looking to add some proper WordPress plugin update functions this year, so that you will get notified within your site when an update is available. Anyway – down to business! Bug fix: pages not being added properly. Bug fix: date field not working properly when it is empty. Bug fix: memory usage reduced. New feature: multiple content areas. The first and biggest new feature in SBPM version 2.8 is the ability to use multiple content areas. This will allow you to add more uniqueness to your posts by using 3 different pieces of content or variations on your content. For example, I have used this feature to add an Amazon item on the left hand side of the page on one post and the right hand side on others. To use this new feature, click the tab and enter your content and save the settings. When the posts are made, if any of the 3 content tabs contain content, they will be used randomly. I have added some neat jquery code to make the SBPM settings save much more quickly, without having to reload the page. Not an amazing improvement, but it does make using the plugin much quicker. 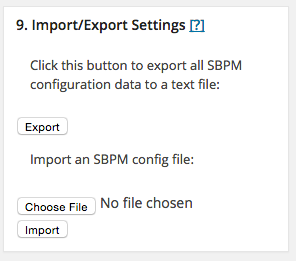 One thing that I have wanted to include for a long time is the ability to export or import all of the SBPM settings into 1 file that can be moved from one site to another. Us affiliates like to build similar sites when we find a niche that works, so being able to quickly set up SBPM with new data and settings is a useful tool. Also, to reflect the greater complexity of the plugin, plus a few new ideas I have in the works, I will be increasing the price from $40 to $69 in the very near future. Unfortunately, Gumroad does not have an affiliate scheme, so the ability to earn some dollars from recommending the plugin to your friends will be gone. However, if you want to set something up, get in contact with me and we can sort something out.